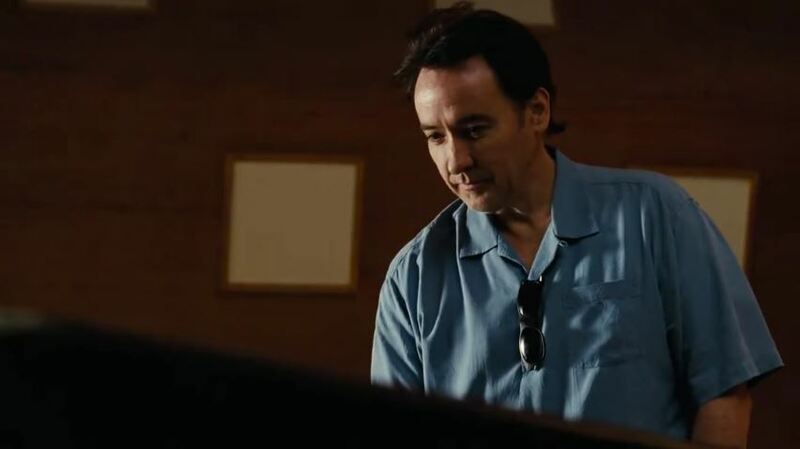 John Cusack in a scene from Bill Pohlad’s Love & Mercy. “Poor Brian, he’s had a rough, rough time,” said Mike Love earlier this year in reference to fellow Beach Boy Brian Wilson. Love & Mercy, Bill Pohlad’s biopic about the band’s leader, certainly wouldn’t disagree with that statement. It depicts Wilson at two different points in his life, and he is portrayed by two different actors. In the first, Paul Dano plays the musician in the mid-1960s, as he undertakes the ambitious album Pet Sounds and faces sometimes fierce opposition. He is also haunted by a shaky physical and mental state that manifests itself into drug abuse, paranoia, and increasing disconnect from the people in his life. Secondly, John Cusack occupies the role in the late ‘80s, as Brian Wilson emerges from the obscuring, foggy, overweight, and generally out-of-it shadow that overwhelmed his life. He meets Cadillac dealer Melinda Ledbetter (Elizabeth Banks), and they hit it off, but their lives are held up by Brian’s 24/7 therapist Eugene Landy (Paul Giamatti), who watches his patient with near-authoritarian hawkishness, convinces him he is schizophrenic, and uses increasingly unorthodox, unproven, and dangerous methods as treatment, while anyone (Melinda included) who tries to challenge his dictatorship of one is subject to the doctor’s persistent attempts to have them banished from Wilson’s life altogether. Love & Mercy’s two-actor approach works well, both creatively and symbolically, over the 122 minute runtime. Depicting twentysomething Wilson and fortysomething Wilson as literally different people shows how split he was at two separate, crucial points in his life. The movie is shot with an inspiring execution, as cinematographer Robert D. Yeoman fills every scene with different sources of color and light, from a paneled recording studio to a dark auditorium mid-concert as blues and yellows from stage lights splash on the characters’ faces in the audience. But I had some problems with the writing, namely how poorly the film handles Eugene Landy – Giamatti is a fine actor, but the screenplay very abruptly turns him from a slightly concerning overbearing figure to a near parody-like monster, with a handful of scenes playing like something out of a horror film. Based on what I’ve read, I have no reason to doubt that Landy could have certainly been like that, but the film doesn’t handle the depiction particularly well. However, what Dano and Cusack accomplish, despite never meeting once during production to compare notes, is a definitive asset, and the thorough examination of the life of such a complex musician and person in general that takes center stage throughout Love & Mercy’s first and second acts does much in the way of forgiving its third act unintentional depths into some sort of psychological thriller (complete with a scene where Landy bangs on a set of windows and screams obscenities at Melinda for at least ninety seconds). Pohlad doesn’t succeed at an entirely tonally consistent or fully successful biography, but the way he goes about most of the film shows artistic passion and the results of a compelling collaboration.